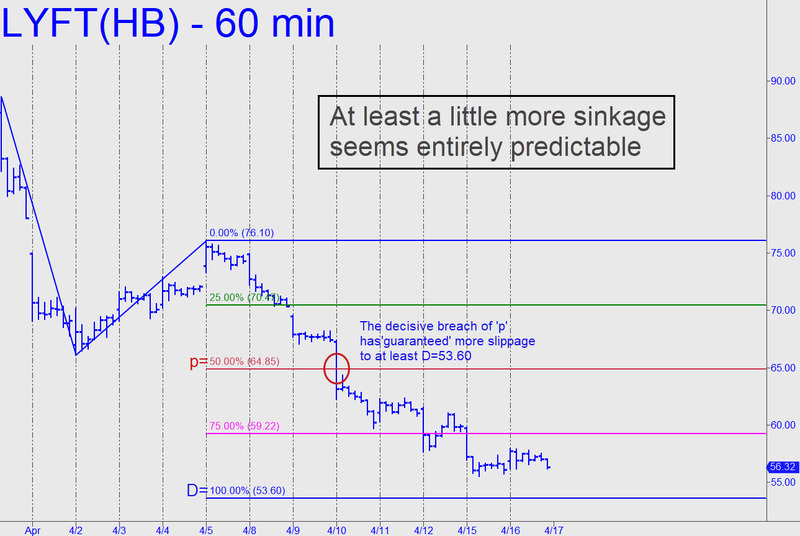 Lyft is all but guaranteed to fall a further 5% to the 53.60 target shown if Hidden Pivot analysis has got it right. A telltale sign that more weakness was coming was the way sellers sliced through the 64.85 ‘midpoint support’ last week. Scalpers can bottom-fish with a 53.62 bid, stop 53.54. Although there is not much price history on the stock, the pattern is still clear, clean and compelling, implying odds are good for a bounce from very near 53.60. The extent of it is unpredictable, but I would expect the stock eventually to continue down into the teens, since the company is unlikely in my opinion to make money. Ditto for Uber, which is hoping to go public at a $100 billion valuation equating to roughly $95/share. However, it seems probable that LYFT’s discouraging performance will keep a lid on the Uber IPO. If the stock performs similarly to LYFT, falling in the first week or two by 39.5%, that would yield a share price of 57.47. You read it here first.